The Middle Ages is a period of the history that has always been so mutilated. In the schools we learned that it was a stage of chaos and constant wars and conflicts created by uncultured and stubborn feudal lords. Some circumstances are certain, of the Middle Ages are studied the wars, successions, the feudal lords and some other important kings, leaving completely aside to those men who had the responsibility of civilization and the welfare of people. What really matters and defines a civilization is their culture, their social organization and the way of life of people in the city or in the country, and not that chaos that existed in the early centuries of the Middle Ages and so highlighted by the history books. In the Middle Ages arose the Benedictines order which, in a society lacking of principles, they were worried about the wisdom of the people, they recovered old documents of the cultures of all the existing civilizations, thereby creating the cult aristocracy ready to govern worthily. Even the Benedictines were interested in the Arab culture, which was the owner of the science and the knowledge of the East, that was longed for the members of the Order of Saint Benedict. To this end they decided to expand them from France to Spain, encouraging the reconquest of the Iberian Peninsula that was in the hands of the Muslims. But, while harangue to wield the sword against the Muslims, the Benedictines maintained contact already in Spain with the Arab culture as scientific and they knew that they would make progress. Spain was a key point for the Benedictines, order which, in the midst of that profound moral and intellectual crisis, "fought" for having the know, attaining great influence at this time (this pioneering spirit would lead to the creation of the Order of Cluny) and giving great characters who, being completely unknown and forgotten today, shocked the entire medieval civilization. One of these characters was Gerbert d' Aurillac, also known as the Pope Sylvester II or the Pope Magician. Gerbert, a young man with an intelligence nothing normal in his time. On Gerbert and his entire life, even discounting what is legend, exceeds the imagination. Picturesque character and uploaded color, Gerbert is one of the most extraordinary geniuses that mankind has produced. It is unclear in what year Gerbert was born, although it is accepted it was between the years 945 and 950 in the Occitan region of the Auvergne, in France. Nor do we know very well if he was a descendant of a family dedicated to grazing in the rural area of Auvergne or, as it is suggested by some investigators, belonged to the family of the dukes of Aquitaine, seeing clearly that they are two very different theories, but is predominantly the first one. Whatever was his offspring, Gerbert was admitted by the Benedictine monks of the abbey of Saint-Géraud d' Aurillac at the age of twelve years, where he studied the "trivium" and the "quadrivium" with the master Raymond Lavaur. The Benedictines were fascinated by the intelligence that young Gerbert showed, fitting perfectly with the model of person that this order was looking for. In the year 963 arrived to venerate the relics of Saint Geraldo of Aurillac, that were preserved in the Abbey, the Conde Borrell II of Barcelona, a city which at that time was closed to the Hispanic Mark created by Charlemagne to stop the advance of the Saracens. Speaking with the Abbot, the count of Barcelona was surprised by the vast knowledge of the young Gerbert, to whom he offered to continue his education in his county, what Gerbert accessed. Already in the county of Barcelona, he continued his education in monasteries such as Vic or Ripoll where he matured his knowledge about science and where he entered in contact with Greek culture and with the arithmetic. This would be a passage of time to be mentioned in Gerbert education. He also stayed in Toledo and Cordoba, where he transformed himself into a wise person, since his intellectual training. As we have said before, the Benedictines wanted to own that knowledge that kept the Arab sealed after having been learned by other civilizations. The Arabs were well-informed of the sciences, being much wiser than the Christians, in addition to having studied things as the heretical gnosis, the Kabbalah and the Egyptian culture. The Benedictines did not send Gerbert to these cities randomly, he was sent so as to enter in that Spain esoteric that concentrated all the knowledge of the moment in the hands of the Muslims. While Christians required any explanation of God, the Muslim scholars were experiencing and looking at the stars. According to the English Chronicler, William of Malmersbury said that Gerbert had gone to Muslim cities like Toledo and Cordoba in search of knowledge of astrology and other sciences airtight, acquiring knowledge that would be disqualified. He also said that he learned magic formulas and discovering new inventions nonexistent in Christian Europe. It is in these cities where they knew the number zero, which later would be introduced in Christianity when he became to be Pope, as well as replaced the roman numerals for the ones used by the Arabs. Gerbert exceeded all their teachers in knowledge less one, from who he wanted by all means to know his secrets; even he came to seduce his daughter. Gerbert left Spain and moved to Reims, where he amazed everyone by his high knowledge and raised the suspicion of others. 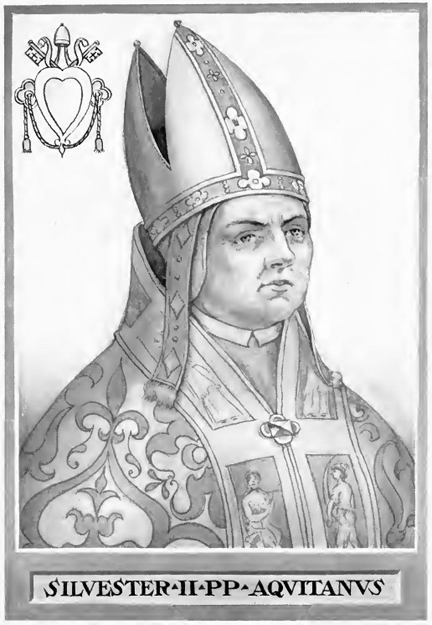 Gerbert appointed Pope: Sylvester II. Thanks to the Benedictines, he was appointed Bishop of the city of Reims where he began to distribute at its headquarters the arithmetic, astronomy, the geometry and the music. This would be the time when the first graph, the globe, an astrolabe of great precision and a pendulum clock were built, until that moment unknown in Europe. To accomplish such inventions, quickly it began to circulate the rumor that Gerbert was a necromancer who had made a pact with the devil, because such inventions could only be made by the Malign. After several intrigues in Reims and after the death of the Pope, the Benedictines demonstrated their power in the Church and put Gerbert as Pope in the year 999. The recent Popes had belonged to the Benedictine order and to continue the tradition and also to be able to continue accumulating knowledge, they decided to place Gerbert, that was a sage who surprised the whole world that dealt with him. At this time Gerbert was transformed into Sylvester II, the Pope of the year 1000, while during his four years as Pontiff until his death in 1003 the people considered him as a warlock who had made a pact with the devil. The Discoveries of Sylvester II. Did he discover the computer in the Middle Ages? From his return in the Muslim world, Sylvester II deployed a revolutionary scientific activity without neither rate nor measure. He has bequeathed to us, and his books can be consulted in libraries, twenty-four mathematical works full of important discoveries, a treaty of geometry, a treaty of weights and measures, and even a treaty of the game of chess, which is not fortuitous if we remember that this game has a prominent esoteric significance. Sylvester II or Gerbert likely was also an alchemist, probably the first Christian alchemist. Tells an old legend in Aurillac that, still young, he had collected gold in the Jordan River by placing in the water a fleece of sheep to which joined a few pips. We do not know if at that time there were seekers of gold nuggets, but the procedure is similar to the practice of alchemy, he also was very advanced in the Ars Magna, since the precious metal was not within the reach of many. He taught at Reims, as well as astronomy and astrology which had been incorporated into their knowledge in Muslim Spain. In addition, he produced the first great accuracy astrolabe, as well as the first watch, free weights and pendulum. He also built a curious hydraulic component in which the differences of steam pressure produced a whole range of musical sounds, machine that probably would be of the interest of our modern music researchers’ cybernetics and electronics. Sylvester II was who introduced in Western Europe, bringing them from Arab centers, algebra and the use of the figures known as Arabic, which replaced the system of Roman figures, which had as its main consequence, in addition to greater ease of calculation, the possibility of using the zero, with all the revolutionary applications mathematics that meant this number. Finally, in full X century, produced a machine that raises the question of whether it was already an ancestor of the computer. In fact, as noted by Gérard de Sède, which is interested in Sylvester II in his book on Templars "Les Templiers sont parmi nous" ("The Templars were among us"), speaks about a device ignored that replied with a yes or a no to the questions that it faced, was even able to predict the future. Silvestre II never wanted to reveal the secret of their employment, but always responded to the question of its operation as something very simple, based on the calculation of two figures, i.e. a binary code, like our computers contemporaries. This description corresponds entirely to a computer. At his death, Sylvester II, because of his investigations and especially because of those machines considered by most of the population as a " witchery ", was cursed for centuries, being sometimes deleted from the list of popes. Gerbert will be remembered as a French Benedictine alchemist that, already in the X century, had learned all the knowledge and secrets of our civilization and the Eastern Sciences, and that he was misunderstood in his time, being a true Magician Pope.